From the moment she stepped onto the Bluesfest main stage for her 6 p.m. set, Noname seemed bewildered and surprised that anyone actually knew who she was. Responding to the smattering of applause spread throughout the massive open field (that will later be shared by fans of Naughty by Nature and Blue Rodeo), the Chicago poet introduced herself to the crowd by spitting her guest verse from "Lost," the Chance the Rapper track from his 2013 mixtape Acid Rap. 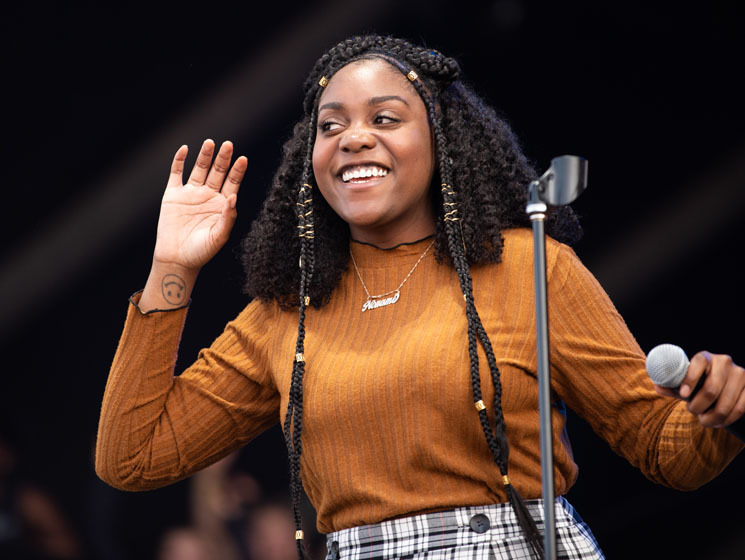 Fronting a five-piece band, which included a guitarist, bassist, drummer and backing vocalist, Noname addressed the audience, asking if anyone had heard of her 2016 debut Telefone. Impressed by the vocal acknowledgement from the growing crowd, Noname slid into the album's bubbly and spacious "Diddy Bop." Running through a number of tracks from her sole LP, including "Bye Bye Baby" and "All I Need," Noname seemed completely comfortable and playful while performing new material, leading the crowd through a joyous, if not botched, call-and-response session. This easygoing demeanor that helped the rapper breeze through an impressive number of tracks during her short set, as Noname played excellently off her live band, leading them into truncated versions of tracks she's guested on, including "Amphetamine" by St. Louis rapper Smino and Mick Jenkin's "Comfortable." Admitting that she was "high as hell" during the performance, which was most likely the contributor to a few false starts and forgotten lyrics, Noname's goofy stage demeanor nonetheless proved to be somewhat charming and pardonable. Accidently cutting her 45-minute set short a whole ten minutes, Noname was marched back on stage by her tour manager to hilariously apologize before spitting her way through the commanding "Shadow Man." Watching pockets of fans impassionedly singing along to the song's closing coda, Noname looked pleased, humbled and completely caught off guard by the love Ottawa bestowed upon her. ​Noname Drops New Track "Song 31"